Designed for laser wire stripping this system operates by rotating the focused laser beam around the wire. Laser power and rotation speed are programmable to accommodate different types of wire or cable via external CNC. Additional motion of the wire holding chuck provides programmable cut length and location to accomplish a wide variety of cut profiles. It can be mounted vertical or horizontal. Although the system is designed for wire stripping applications it can also be utilized for additional applications such as cutting and welding. The system can be ordered in many configurations. 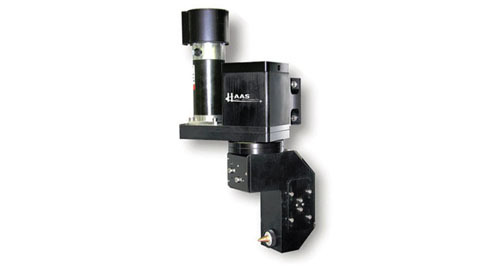 It is also available with CCD camera options and couplers for all fiber lasers. It is available for all laser wavelengths. Robust industrial design. Contact Haas Laser Technologies, Inc. for additional details for your specific application.